You may have noticed that Vogue Paris is like a personal mood board for Emmanuelle Alt. 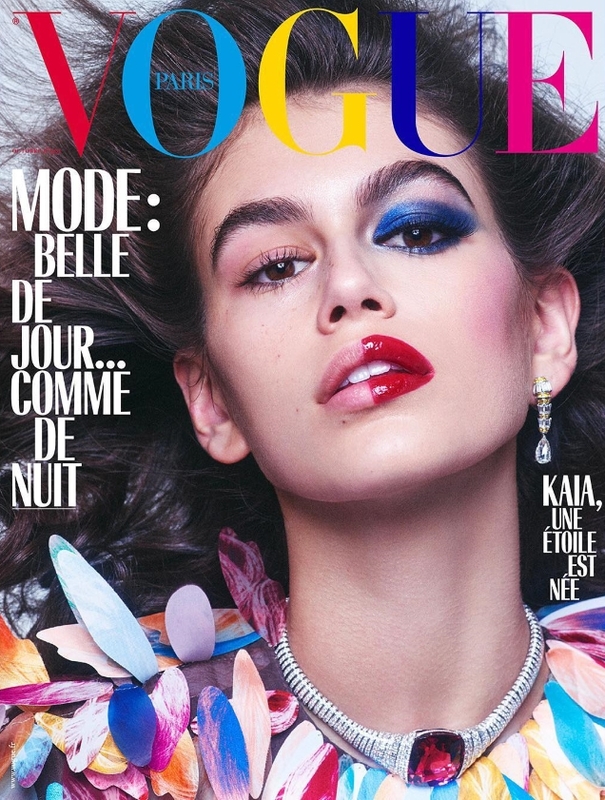 She is forever injecting her own personal style into the pages of the magazine (as well as its covers) and putting her favorite models on the front cover, like last month’s umpteenth Kate Moss cover and this month’s Kaia Gerber cover — her third for the French magazine. The 17-year-old American beauty first made her debut for Vogue Paris alongside mom Cindy Crawford in April 2016 and now, two years later, already has two solo covers under her belt. Returning eight months after her last appearance, the current face of Moschino is photographed by Mikael Jansson and styled by Alt wearing a Louis Vuitton tunic and a bold, playful makeup look. The cover, however, did not appeal to our forum members. “I get the idea behind it — but for the cover, I wish they’d gone for the full-on face, because, yes, this looks like a child-clown to me, forced to dress up. It’s like seeing a mild psychological breakdown performed through the medium of makeup,” commented tigerrouge straight away. “Very clownish indeed…” chimed in GivenchyAddict. “I think I would have liked it a lot more if it weren’t for the multicolored masthead… like, why? It makes it look like a children’s magazine,” added dodencebt. Morgane07 felt the same way. “It’s not working for me, she looks like an ordinary child here to me, albeit a pretty one, ordinary as opposed to a young Brooke Shields or Milla Jovovich for instance or what we want or expect to see on a Vogue cover,” she critiqued. “I find it badly executed. Extremely disappointed to see Kaia for a second time on a VP cover this year,” Valentine27 complained. “This feels very gimmicky and the multi-colored masthead isn’t helping. I think it’s high time Vogue Paris got a new EIC,” suggested Nepenthes. Clownish or chic? Share your thoughts on Vogue Paris’ latest cover here. Devon Aoki Is the Face of Moschino’s New Toy 2 FragranceBritish vs. American ELLE: Which Has the Best Selena Gomez Cover?